As my readers will not have failed to notice, my love affair with music – especially progressive rock – has cooled down considerably over the past few months. A combination of personal issues and the inevitable burnout caused by the punishing pace maintained for over three years forced me to take a break after I realized that writing reviews had become a chore. Though I had previously experienced periods of writer’s block, this time around it had impaired my enjoyment of music to the point that I was dreading, rather than anticipating, the evening of April 20, when the celebrated Steven Wilson and his “all-star” band were slated to grace the stage of Washington DC’s historic Howard Theatre. I will therefore apologize if this piece is more of a collection of personal impressions than my usual detailed account. 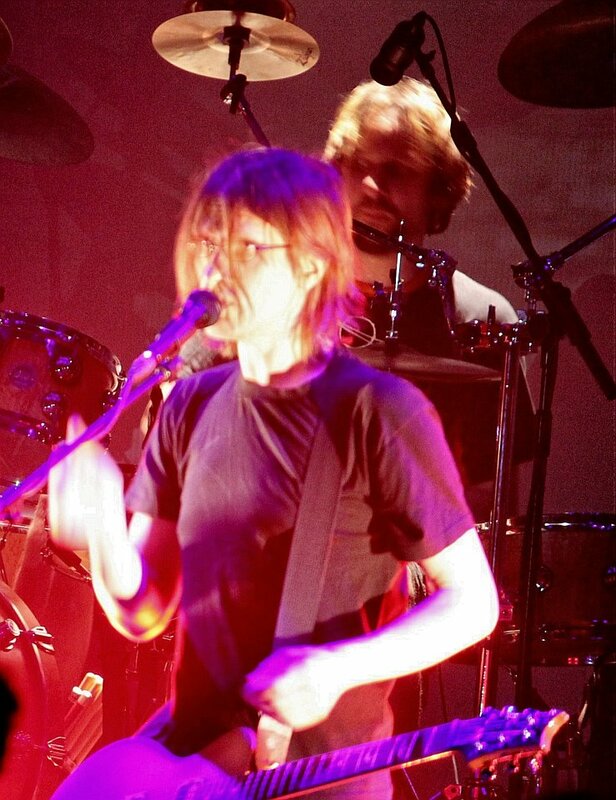 Most of my readers are well aware that – while recognizing the man’s talent and unstinting work ethic – I have never subscribed to the Steven Wilson cult, and most of his output (whether solo or with his many projects, including Porcupine Tree) has always failed to fully resonate with me. Though I had meant to get Wilson’s latest opus, the highly acclaimed The Raven That Refused to Sing (And Other Stories) to familiarize myself with the material before the show, my disenchantment with music (coupled with other, unrelated issues) prevented me from doing so, and I went in expecting to be somewhat underwhelmed. However, I am glad to say that the concert vastly exceeded my expectations, and I walked out of the theatre with a renewed appreciation for music of the progressive persuasion, even if not yet fully converted to the “Wilson cult”. Mainly known as a temple of jazz and soul music, the renovated Howard Theatre (opened in 1910, but gone into a decline that forced it to close for decades after the 1968 riots) has already hosted a number of rock concerts since its 2012 rebirth. While its stylish, dimly lit interior does not allow for a lot of socialization, and its bar and restaurant menu are not exactly good value for money, the theatre’s superb acoustics, state-of-the-art lighting and spacious stage are designed to enhance any music performed there. What better setting, then, for über-perfectionist Steven Wilson, the high priest of pristine sound quality, the man behind a slew of 5.1 reissues of progressive rock classics? 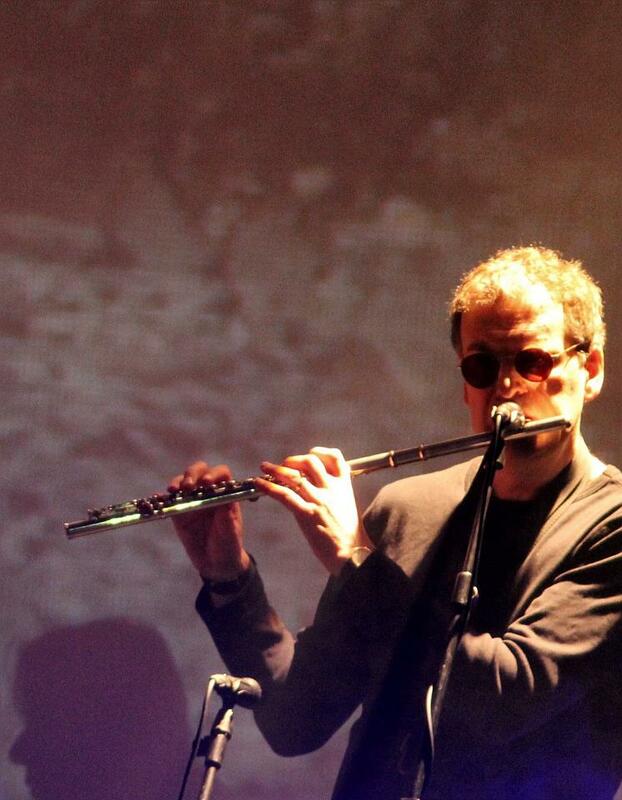 I am generally rather suspicious of supergroups, which can often be a triumph of style over substance, and the all-star cast assembled by Wilson for his latest album and tour brought back memories of Eddie Jobson’s Ultimate Zero Project’ rather sterile headlining performance at NEARfest 2010. In spite of being prepared for the worst – that is, an ultimately soulless display of technical fireworks – the opening strains of “Luminol” put my fears to rest, immediately pushing Nick Beggs’ impossibly nimble bass lines and Marco Minnemann’s thunderous yet intricate drumming into the limelight, though at the same time emphasizing their contribution to the composition as a whole Indeed, the extremely tight outfit allowed very little room for solo spots, and each of the musicians put his own considerable expertise at the service of the songs. 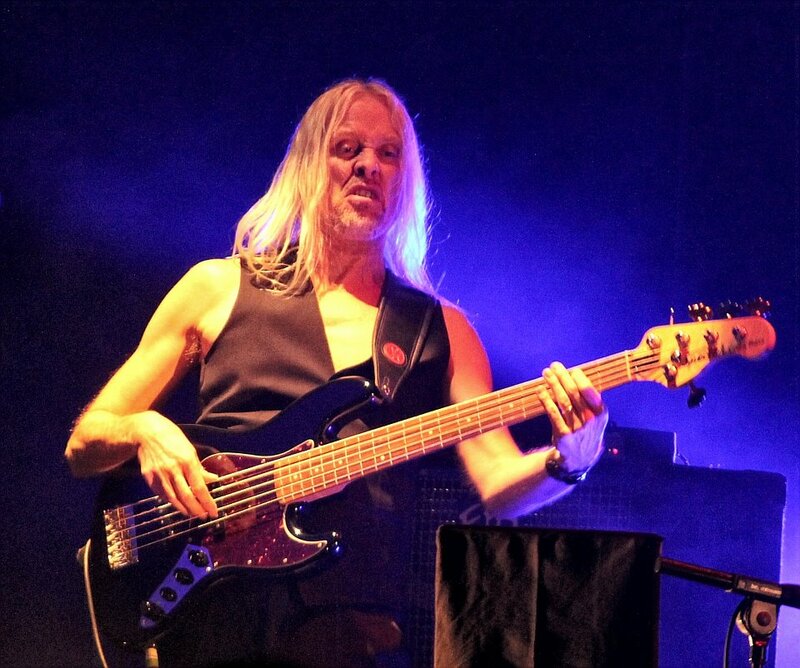 In the centre of the stage, slight and dressed in black, the obligatorily barefoot Wilson, flanked by Beggs and guitarist Guthrie Govan, switched between guitar, keyboards and 5-string bass, with Minnemann, keyboardist Adam Holzman and reedist Theo Travis positioned at the back. Though I fully expected Govan to launch into lengthy shred-fests, his understated role was undoubtedly one of the show’s most positive surprises. 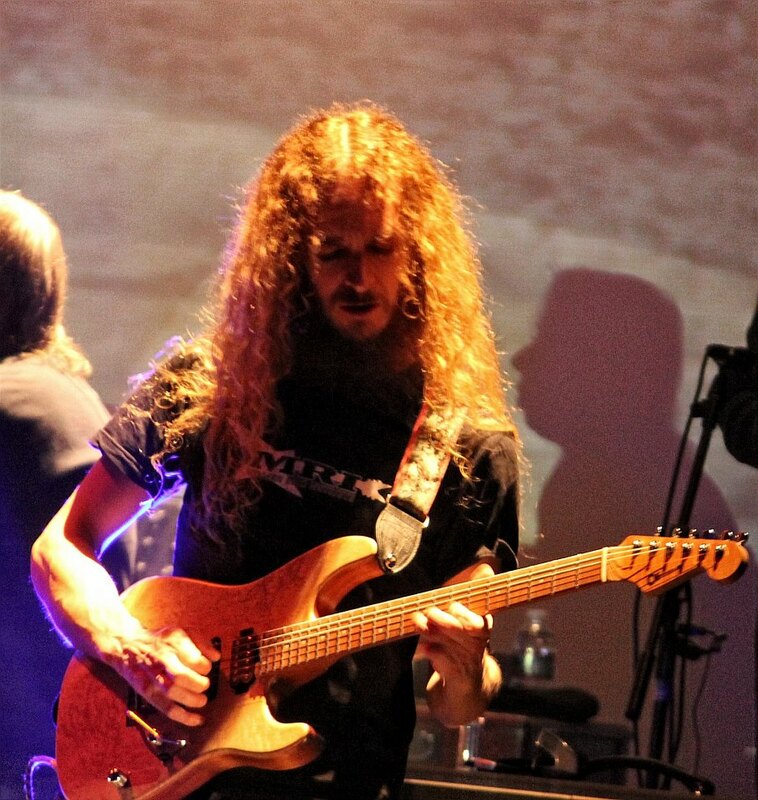 In spite of his standard guitar-hero image (complete with flowing locks and the occasional shape-throwing), his performance was remarkably restrained, his trademark scorching fretboard work delivered on rare occasions, such as at the end of “Drive Home”. The impassive Theo Travis’ blaring saxophone injected a jazzy, almost frantic note, while his flute’s meditative tones complemented some of the more subdued passages. Adam Holtzman’s magnificent keyboard textures laid out a rich foundation, in turn atmospheric and dramatic, according to the needs of each composition. Over nearly 2 and a half hours, Wilson’s latest album was performed in its entirety, the seven songs interspersed with tracks from the artist’s two previous solo efforts, Insurgentes (2008) and Grace for Drowning (2011) – with no references whatsoever to Porcupine Tree, who seem to have been put on ice for the time being. While this might be bad news for the band’s many fans, I feel that The Raven That Refused to Sing features much stronger material than most of PT’s albums from In Absentia onwards. Indeed, in Wilson’s solo output any overt metal or alternative rock references are eschewed or toned down, though a keen edge is always lurking around the corner. Even in the longer compositions, any excesses are reined in by keeping the emphasis firmly placed on the songwriting. Drawing upon the wide range of diverse experiences of his band members – jazz, avant-garde, metal, pop, classic rock and, of course, “traditional” prog – Wilson as a solo artist has built a sound in which his very vocals become an additional instrument, with lyrics kept to a minimum taking a back seat to the music. The unrelentingly gloomy subject matter (cleverly targeted by Wilson’s surprisingly laid-back stage banter) is reinforced by a skillful use of visuals that develops and refines Pink Floyd’s ground-breaking paradigm, conjuring disquieting, often nightmarish images out of an H.P. Lovecraft story (in particular the ones accompanying “Harmony Korine”), and proves a necessary complement to the music. While Wilson’s music is not exactly innovative (and very little of what is released nowadays can be called so), he succeeds in the feat of updating the classic prog sound, using King Crimson, Yes and Genesis as a springboard rather than as a template. Veering between the brooding, haunting atmosphere of the likes of “Drive Home” or “Deform to Form a Star” and jagged, frantic-paced moments in which all the instruments strive together to build up an increasing sense of tension, his compositions sound as carefully structured as any of the Seventies classics, though not as blatantly contrived as a lot of modern prog. From a personal point of view, I found those driving, dynamic pieces far more involving and emotionally charged than the quieter, moodier ones, which tended to sound somewhat alike after a while. 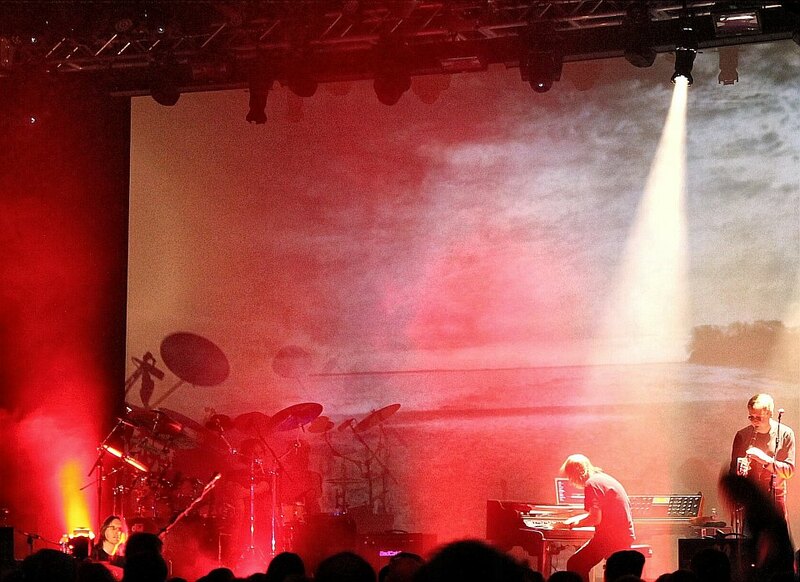 In a show characterized by a consistently high level of quality, two songs stood out: the creepy, chilling “Raider II” (from Grace for Drowning) and the mesmerizing “The Watchmaker”, during which the band played behind a semi-sheer curtain used as a screen for the stunning visuals. Considering Wilson’s tireless activity as a producer and sound engineer, it was a fortunate coincidence that April 20 also celebrates a cherished institution that is stubbornly resisting the encroachment of online sales – record stores. Not surprisingly, the venue was packed, with many far younger attendees than the average prog gig or festival – a testimony to Wilson’s appeal to a large cross-section of the concert-going, music-buying public, even to those who are not necessarily into “progressive rock”. Watching the crowd, and reflecting on the poor attendance of most prog shows, I thought that Steven Wilson must be doing something right in order to attract such large numbers, even if his band (no matter how talented) does not include any of the Seventies icons, and his performances showcase very recent original material rather than the ever-popular tributes and covers. Moreover (and rather ironically), now that he has stopped rejecting the “prog” tag and fully embraced the genre, his music has gained in appeal. Not being a PR expert, I have no ready explanation for this phenomenon, but I am sure there must be a lesson somewhere for the multitude of prog bands that struggle to draw a crowd larger than 30 people. 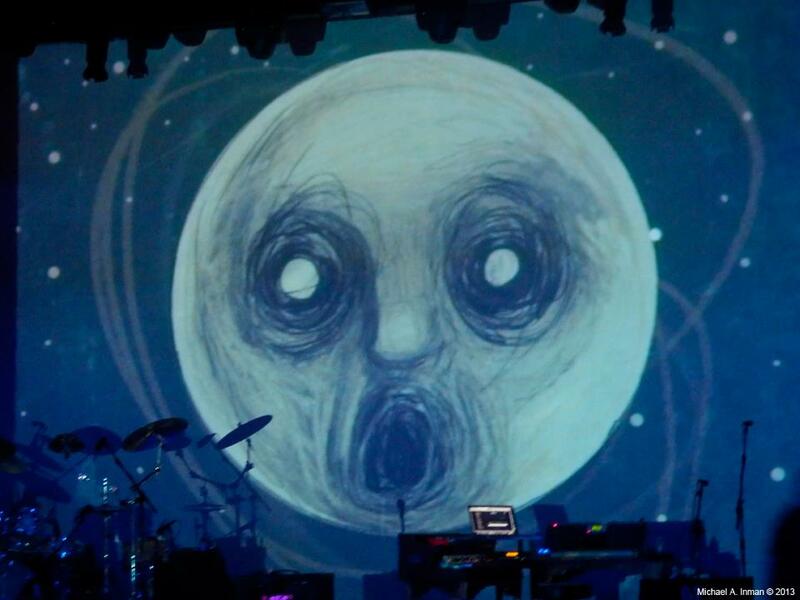 Even if I cannot see myself resuming the same pace of the past couple of years as regards writing reviews – at least not in the foreseeable future – I am grateful to Steven Wilson and his outstanding crew for showing me that music can still have an important role in my life as a source of enjoyment. By way of a conclusion, I would like to thank friends Michael Inman and Helaine Carson Burch for putting some of their outstanding photographs at my disposal for this article. Bravo! Wonderful review…very honest and as usual concisely written, What a great thing to hear after the show was over that this gig inspired you to write a review. Since I knew you were not feeling the music these days. That was a true testament to the fact that this concert worked as a whole piece. Me, I am sold I didn’t need to be convinced that I would love this. And I didn’t try to convince you that you would but it was nice that it exceeded your expectations. Thank you for the kind words, Mike! It was great to see you again, and we will be looking forward to ProgDay! Wonderful…..now I’m set with pics and a great description of a memorable performance. On to the next, my dear! A most excellent review, Raffaella. I’m not a member of the Wilson cult, but I’m a fan after seeing the show. I hope to see you come out of (semi) retirement and write more! Thank you so much, Ian, and best of luck with your own blog!